Lexus unveils new RX450h hybrid 4x4 | What Car? Lexus was the first company in the world to introduce a hybrid 4x4, and at the Los Angeles show it pulled the wraps off the all-new second-generation version. 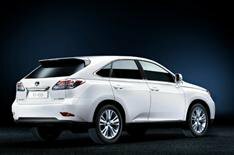 The RX450h is likely to be in the UK by early next summer alongside a conventional petrol model, the RX350. Both are powered by 3.5-litre V6 petrol engines, but while that in the 350 works unaided to develop 275bhp, the 450h's is assisted by an electric motor: together they produce 295bhp a 10% performance increase on today's RX400h, but with an 8% fuel saving. The V6 drives the front wheels while the motor assists by powering the rears when needed. The 350 is being offered in America with either front- or four-wheel drive. Hybrid powertrain developments include exhaust-heat recovery to make the engine warm up to its most efficient operating temperature more quickly, and cooled exhaust gas recirculation to improve efficiency. The hybrid has also been styled to look a little different to the 350, with a unique grille, badging, front bumper, wheels and blue-tinted lamp units. Both cars are slightly larger than before, improving space for up to five occupants. There are improved instruments and controls, with the option of a head-up display that beams essential information onto the windscreen in the driver's eyeline. There's also a simpler sat-nav system Lexus calls 'remote touch'. It even gives up-to-the-minute on-screen weather updates.